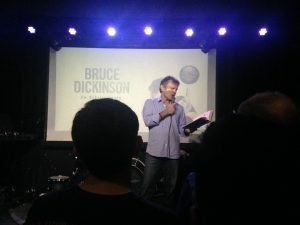 I had the rare opportunity to meet the almighty Bruce Dickinson of Iron Maiden on Halloween night at St. Vitus in Brooklyn, NY where he was signing his new autobiography, What Does This Button Do? After reading the book, I have even more respect for him if that’s even possible. 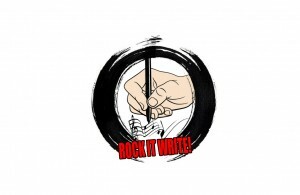 The man fronts one of the biggest bands in heavy metal history, is a top fencing competitor, flies commercial airplanes in his down time and has recently fought cancer and won! That night, Bruce treated us to a pictorial slide show with hilarious stories to match. Not long after, singer Paul Di’Anno was fired from Iron Maiden and in steps Bruce, who winds up taking Iron Maiden to the next level and then some! It was interesting to read that Bruce and Maiden founder and bass player Steve Harris would often battle for center stage and eventually came to a truce on who would stand where and when. The Maiden machine released and toured The Number of the Beast in 1982, Piece of Mind in 1983, and Powerslave in 1984. Next came Somewhere in Time and Seventh Son of a Seventh Son. Throughout these years, Bruce continued to develop his fencing skills and would often compete wherever he was in the world to learn new techniques. If that wasn’t enough to occupy his time, he began dabbling in flying small planes which turned into a full time gig of flying commercial aircrafts! Bruce is known to fly the band around while on tour using Ed Force One, a Boeing 747 plane adorning mascot Eddie’s image. Bruce came to a crossroad in his life where his heart was no longer in the rigors of recording and touring Iron Maiden albums. He decided to part ways with Maiden in 1993 and began working on a solo project which yielded 6 albums and a number of hit songs. To the relief of Maiden fans everywhere, Bruce rejoined the band in 1999 and they released their 12th studio album, Brave New World, in 2000. From 2000 to present time, Bruce has been involved in many different projects involving radio and television, writing a novel, movie producing (Crowley – great movie) and selecting the beer that would become Maiden’s highly successful brand Trooper, which he drank on stage that night during his presentation. In 2014, Bruce was hit with some grim news when he had a check up on a golf ball sized growth on his tongue. It was cancer. Just as Bruce often takes life by the horns, he also did so when it came to cancer treatment. Bruce read to the audience several passages from this chapter regarding how he wanted accelerated treatments and how he’d suffered greatly during this time. From exhaustion, to loss of taste, to his hair falling out, and the nausea and pain that goes along with radiotherapy, he endured. About 6 months later, Bruce had gotten the all clear on his diagnosis and not long after that he embarked on The Book of Souls world tour. Many of us Connecticut folks attended those east coast shows and can attest to the fact that his voice was as powerful as ever and the whole band ran, jumped and ruled the stage. 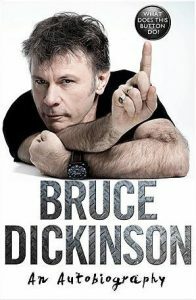 Bruce Dickinson is a force of nature. When he signed my book and I looked into his eyes, I felt a surge of power knowing that I was looking into the eyes of a god! Bruce says all the successes he’s had in life have been the result of him taking a leap of faith in spite of fear. My only disappointment with the book is that he purposefully did not write about his relationships or children. I was so curious to read about the lucky lady who married him, but Bruce doesn’t owe us anything so I’ll take what I can get. To read all about Bruce for yourself, find it on the internet or perhaps check it out at your local public library. And for more from Alternative Control, find us on Facebook, Twitter, Instagram, Soundcloud, and bandcamp.